The issues surrounding ethical controversies in sport are often touched on in the popular media. This book by leading international scholars in philosophy and the philosophy of sport provides systematic treatment of the ethics of sport from a range of perspectives. 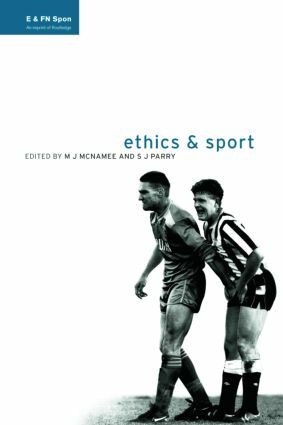 Part one includes essays which focus on the basis of sport as an activity that is inherently ethical. Part two concerns the nature of the oft-heard but seldom-clarified notion of fair play. Three essays are included which articulate substantively different interpretations of the concept all of which have different allegiances in ethical theory and practical consequences. Part three deals with ethical questions in physical education and coaching, and Part four, on contemporary issues, includes essays which focus on topics such as violence, conflict and deception. This book is accessible to a wide range of teachers and students in the field of sport and leisure studies. Contributions from international, highly regarded experts in the field to provide the reader with the systematic treatment of the ethics in sport from a diverse perspective. Part One: Theoretical preliminaries. Are there philosophical issues in respect of sport (other than ethical ones?) Ethics and the double-character of sport: final attempt to systematize the discussion on the ethics of sport. Part Two: Fair play and sporting behaviour. 'Fair game': rules, rawls and the limits of contractarian ethics in delinating the morality of game playing. 'Fair play': historical anachronism or topical ideal? Merely meat: respect for persons in sports and game. Part Three: Ethics and continental philosophy. Spor a way to the authentic self. In the zone: Heidegger and sport. Phenomenology and sport. Part Four: Ethical issues in physical education and the coaching of sports. The moral significance of physical education: anatomy of a problem. Moral development researcher's quest for objectivity: on whether the judgement-passi hurdle can be cleared. Physical education, morality and emotional development. Part Five: Ethical issues in contemporary sports. Multinational sports and literary practices and their communities: as essay on the moral salience of cultural narratives. Cheating and self-deception on sport. Sport is for losers. Must we prohibit violence and violent sports? 'How far can you go?' supererogatory acts and the limits of the sporting ethos. Index.